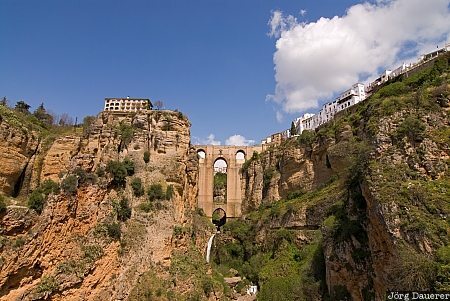 The spectacular Puente Nuevo (new bridge) in Ronda which crosses a deep gorge of the Guadalevin river in front of a blue sky with a few white clouds, Andalusia, Spain. This photo was taken in the early afternoon of a sunny day in April of 2008. This photo was taken with a digital camera.